GE Aviation has acquired OC Robotics, a Bristol, UK-based designer and manufacturer of commercial snake-arm robots and software for confined and hazardous environments. Founded in 1997, OC Robotics' robotics expertise will support GE Aviation's Services organization. "OC Robotics will play an important role in how we service our customers' engines," said Jean Lydon-Rodgers, vice president and general manager of GE Aviation's Services organization. "This acquisition will expand our component repair development capabilities and increase the efficiency of the On Wing Support team as they perform inspections and repairs on our customers' engines." Craig Wilson, Managing Director of OC Robotics said "OC Robotics was formed with the hard work and dedication of our team along with the support of investors and the UK government. The acquisition will help accelerate our growth opportunities in the aviation sector and enable advanced UK technology to play a larger role on the world stage." OC Robotics Technical Director Andy Graham said, "For 15 years, OC Robotics invested heavily to develop snake-arm robot technologies, and the aviation industry has always been a target area for this technology. This acquisition represents a significant opportunity for the OC Robotics team to deploy our technology through a world-leading organization." 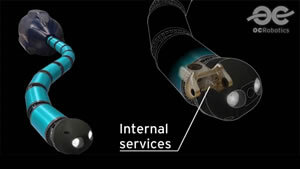 With a reach of more than 3m and a cumulative bend of more than 180°, OC Robotics' flexible snake-arm robots work in tight spots and can conduct various tasks, including inspections, fastening, and cleaning when integrated with tooling. OC Robotics is active in the aerospace, nuclear, petrochemical, security, and construction industries throughout Europe, North America, and Asia. Terms of the acquisition are not being disclosed.